Performers include: Justice Smith, Shameik Moore, Herizen F. Guardiola, Jaden Smith, Skylan Brooks, Tremaine Brown Jr., Yahya Abdul-Mateen II, Jimmy Smits, Daveed Diggs, Giancarlo Esposito, Stefanée Martin, Shyrley Rodriguez, Karen Aldrige, Mamoudou Athie, Zabryna Guevara, Ron Cephas Jones, and Eric Bogosian. 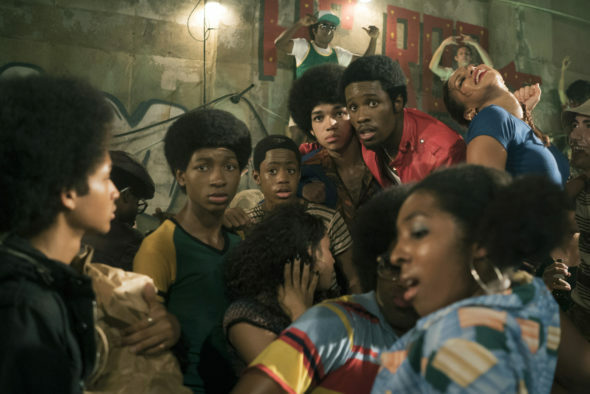 A late 1970s musical drama series set in the South Bronx, The Get Down recounts the death of disco, as well as the birth of hip-hop. The title comes from a phrase used to describe particularly danceable sections of records which DJs can repeat by using multiple turntables. Dogged and determined, Mylene Cruz (Guardiola) is the object of young Zeke’s affections. This talented daughter of a Pentecostal pastor, dreams of being a disco star and is desperate to leave the Bronx. She refuses to let anyone hold her back, including not only her disapproving father, Ramon (Esposito), but also poor, smitten Zeke. Ramon’s brother, Francisco “Papa Fuerte” Cruz (Jimmy Smits) is a political operative. He arranges for a music producer to hear Mylene sing at church, which she does in defiance of her father’s wishes. Wild child graffiti artist and aspiring DJ Shaolin Fantastic (Moore) is mysterious and capricious. He’s not convinced Mylene is right for Zeke and does not trust her. Grandmaster Flash (Athie) mentors Shao in the art of DJ-ing. Mylene’s friends Yolanda Kipling (Martin) and Regina, are members of the Soul Madonnas. Restless and recalcitrant, Regina is involved in an abusive relationship with Little Wolf (Tory Devon Smith). Yolanda’s brother, tagger Marcus aka “Dizzee” (Jaden Smith), is Zeke’s best friend. Their brothers are Ronald aka “Ra-Ra” (Brooks) and Miles aka “Boo-Boo” (Brown). Along with Zeke, the boys are also members of Shaolin’s group, The Fantastic 4+1, who ultimately become The Get Down Brothers. The series explores New York City at the threshold of bankruptcy, during the nascent days of a new art from that would take the world by storm. While the B-boy rallies in defense of the get down, Mylene’s musical fate hangs in the balance. Zeke receives some life-altering news. First aired: April 7, 2017. What do you think? Do you like The Get Down TV show? Do you think it should have been cancelled or renewed for a second season? The Get Down: Why Did the Netflix Series Take So Long? Best serie I ever saw, from story, to cast, to production everything was absolutely perfect mind blowing and fabulous. They have bring back the show with exactly the same team. This was such a good show. I can’t believe it’s been canceled. Such a bummer. Please bring it back. I watched the first episode and that’s all I could get through….I heard the second half was better but I just couldn’t stomach it….I’m a hip hop head too so I had high hopes for it!!!! This HAS to be renewed. It’s the best show on Netflix.